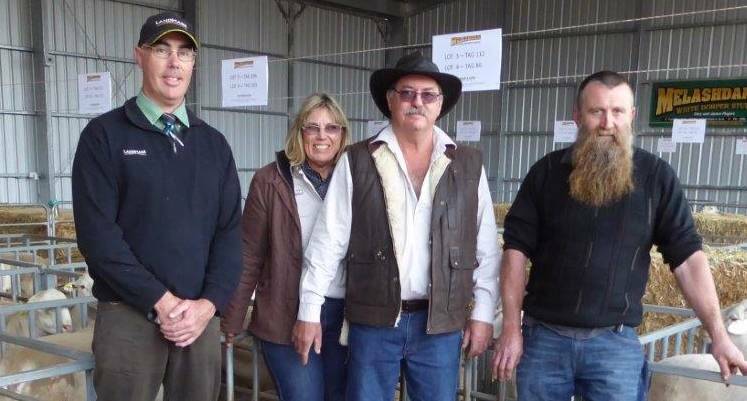 Offering 56 White Dorpers and 19 Dorpers, the Fiegert’s ninth annual Melashdan Dorper and White Dorper ram sale was held at a Tumby Bay property on Tuesday, September 11, with the top ram selling for $2700. Only one Dorper was left unsold, with a top of $1000 and an average of $778, and 48 White Dorpers were sold for an average of $1179. Bought by Emu Rock Stud’s Trevor Lock from Clare, the top White Dorper – classified as a stud ram by an international Dorper inspector – had a sale weight of 100 kilograms and an exceptional length, structure and carcass quality with a solid lambplan ASBV. A total of 14 stud rams were offered in the sale which had strong support from new and regular clients. Three rams were sold for the price of $2200, with two purchased by Orroroo’s JA Shackleford and Sons and one by Rudall’s WM Herde. All of these rams had excellent Lambplan ASBV’s for good growth muscle and number of lambs weaned, suiting commercial breeders producing prime lambs. Click here to read the full story by Jon Ovan for the Port Lincoln Times.